Speed Demon Video Included! Tap the YouTube button after the arrow click. My 20th loaf of soap! And I worked up the nerve to enter the Amy Warden Soap Challenge Club with the challenge "Tiger Stripes". I have never tried tiger stripes before and I spent lots of time studying how to keep my soap manageable and runny for the pouring process. The video's offered at Amy's site were a real help too. At first I was very tense. Planning this soap was more intense than the other soaps I've made. I wanted to use my favorite color and cap with white. On top a little glamour with clear glitter and gold mica and pink mica soap shavings. 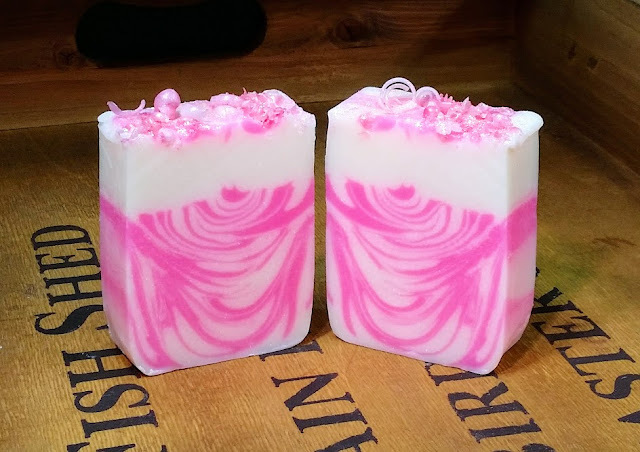 My fragrance is Lily of the Valley by Bramble Berry- fab to work with! For some reason I kept thinking about the movie "What's Up Tiger Lily". soap at room temperature (overnight even!) How much more laid back could I get? Calming down lead to making my soap just the way I wanted it. I really couldn't be much more pleased- it turned out exactly as I planned. I wasn't quite ready for how long it's been taking to cut and handle the soap- but, oh well, it's curing nicely now. It's simple, but sweet and romantic. Wouldn't a bunch of these in assorted colors be lovely! 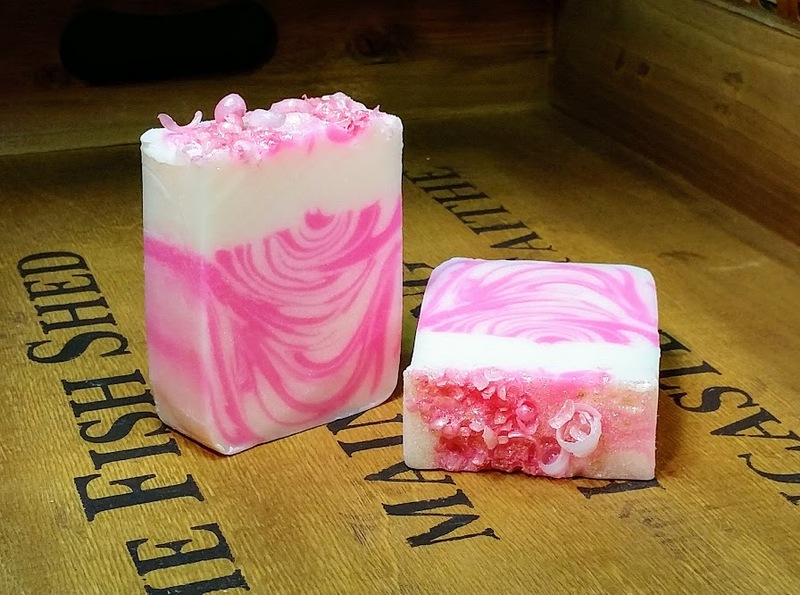 I like the soap I made, I hope you've enjoyed them too. There are only 5 of these little guys and will be ready about January 24th.